Container candle making instructions can help you get started making your own homemade candles. Once you've mastered the basics of making a simple container candle, you'll be ready to move on to more complicated candle making projects. The key to choosing a container for candle making is that you must be working with something that is both leak proof and fireproof. Container candle making instructions are fairly straightforward, but trying to make a candle in an unsuitable container is a recipe for disaster! Glass is a good choice for making container candles because it allows the color of the wax to be visible. Many people prefer to make their container candles in glassware with a lid, although this is a decision that is best left up to the individual crafter. At your local dollar or discount store, you can find a variety of containers that can be used for making your own candles. Thrift shops, consignment stores, and garage sales are also a good source of cheap containers. The basic container candle making instructions are fairly simple to follow, even if you've never made a homemade candle before. Wash and dry your container to make sure it is free of any dirt, dust, or debris that could become trapped inside your candle. Melt wax in a double boiler, stirring continuously. Paraffin wax is easily combustible, so it should never be melted directly on a stove burner. For safety, the temperature of your wax should never exceed 250 degrees Fahrenheit. Add any necessary color or fragrance. 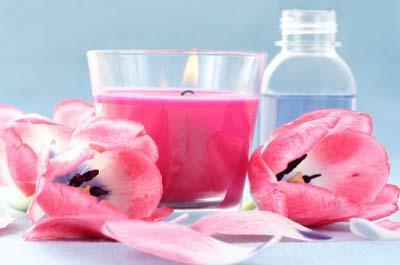 One ounce of fragrance oil per pound of wax is the standard candle making ratio, but you may need to adjust this amount if you prefer a heavily scented candle. Microwave your container for approximately one minute. This will help to ensure that your wax doesn't leave air bubbles on the container as it hardens. Remember to use potholders to protect your hands when removing the hot glassware from the microwave. Place the container on an old cookie sheet to make sure your work surface is protected against accidental wax spills. When the temperature of your wax measures 190 degrees Fahrenheit, fill the container with wax. Stop about one inch from the top of the container. Gently place the wick into the bottom of the container, using a Popsicle stick or pencil to center it. If the wick seems to be moving as the wax cools, gently tug it back to the center. When your candle is completely cool, pour reheated wax into the small hole near the wick of the candle. For best results, the wax for this pour should measure about 195 degrees Fahrenheit. Wax at this temperature will melt the first pour slightly, minimizing any unsightly lines in your candle. After the candle is completely cool, trim the wick to about ¼ inch. Decorate the container with ribbons, scrapbooking rub-ons, or other embellishments if desired. Container candles have all the rich colors and fragrances of their pillar and votive counterparts, but they come in pretty containers that can be reused after the candle has finished burning. A container candle is also a very economical choice for your home décor, since the design allows the candle to burn down to almost nothing.